Bring the romance of rustic Americana home with this whitewash canvas floater picture frame. Made from reclaimed barnwood and handcrafted in the US, each frame is one-of-a-kind with random nail holes and knots. 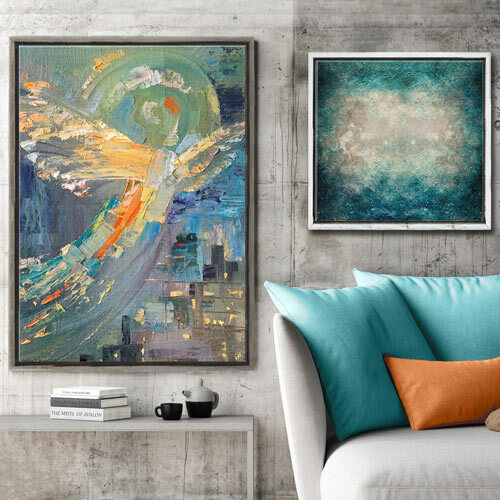 The "float" space beautifully showcases and suspends your favorite oil paintings or photos on canvases up to 1 ½”. The white border and the gray borders are only 1/2" inch wide (even narrower than the 11/16 stated). However, I made the mistake of purchasing the frame based on the photo posted on the website as seen here. The photo depicts a MUCH wider frame around the picture. VERY deceiving. The gray is so narrow you can't even see it when the picture is in it. I wouldn't have purchased it had I known. Anthony we appreciate your feedback. We sincerely apologize that the frame did not meet your expectations. Please consider ordering free samples of our frames so you can determine if the frame will work for you. 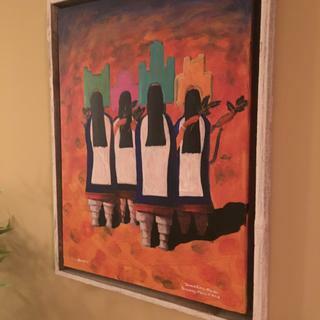 If you would like to return the frame, please give us a call at 1-800-332-8884. We will email you a return label and give you a refund for the frame. Thank you again for your business. I haven't been framing many of my pieces, especially my Shabby Chic florals. Then I tried one of these white washed floating frames. I was blown away by the difference. You just can't compare it. This frame enhances my paintings to the max! You have to try it to believe it. 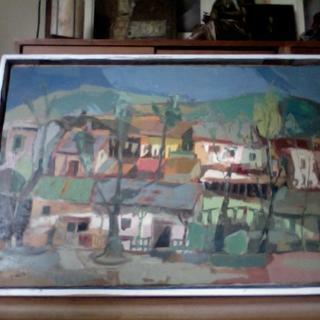 This frame added just the right degree of rustic charm to this mid century island painting. Added just the right rustic touch to this mid century island painting. 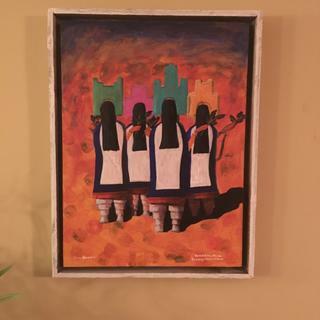 Rustic worked well on this New Mexico original – going with the whitewash made the corn dancers pop. 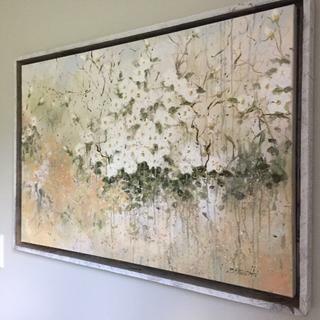 Nice frame for a geothermal painting to highlight the white pools. This frame is exactly as I envisioned. Very rustic! Shabby Chic . Great frame. 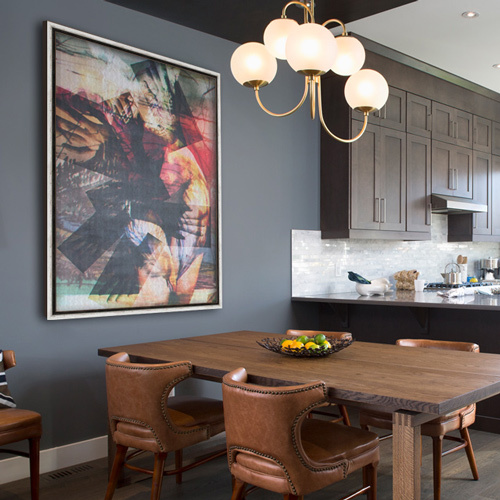 Quality, Rustic yet sophisticated. Goes great with most any interior and artwork you are framing. I am pleased with my barnwood floater. It may be slightly more rustic than I was expecting but it complements my painting nicely. There was no way to attach this frame to my canvas. I eventually needed to just use glue (not an optimal solution). Also, the first one of these I received was badly dinged and the wrong size. The one resent to me was better but still not great. Hello Kathy! Thank you for your response. We regret that the replacement frame arrived in less than excellent condition. As a courtesy to you, we would like to offer you a discount on your next order. The discount can be applied to your next online order or if you call us and place the order over the phone. We hope this will help make it right with you. Thank you again for your business. Happy Framing! This frame will enhance the canvas photo ten fold and balance of overall color. I just framed a very large shabby chic floral that I painted for my daughter in law with this frame to go in her dining room. What a difference it made! Just beautiful! I like the coastal look. I've purchased this many times for my art work....my clients love them! I love floater frames. They are simple yet really help your artwork show nicely. The white distress works well with my beach theme painting. Yet not just a shiny white frame. I like adding the texture with the distressed finish. There appear to be two different frames pictured and the dimensions don't make sense. 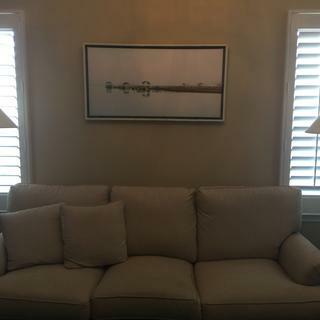 The pic with a print looks like a standard frame where the frame rests on the canvas while the rest of the information and the other picture seem to portray a floating frame. The rabbet is 1.5" while the entire depth of the frame is 1 1/8 " If a floater, how can this be true? BEST ANSWER: Hi Janet, thank you for reaching out to us! We apologize the diagram did not portray the corrected measurement. The outside height of the frame is 1 3/4". This frame is a floater frame. We do offer samples so that you can ensure this is the perfect frame for you. If you have further questions or concerns, please don't hesitate to ask! Floating frame. Pic is just shadowing. 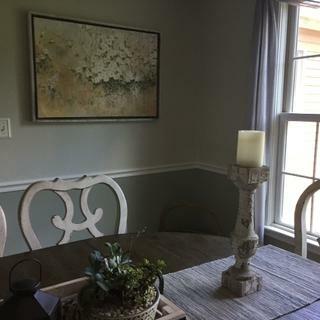 It's a standard floating frame in a distressed barn wood finish. I believe every frame is unique. They are exquisite and really provide a great look if you're into distressed barn wood. I've bought them before and I would definitely order again. Get a sample if you're unsure. I have bought 4 of these frames and they are floaters. What you see on the photo is the half inch white portion of the frame and the inside little ledge gray where your canvas sit. I really like this frame made with recycled barn wood. It has an old fashion look to it but in reality it is very modern. This photo is very deceiving, they really should change it. 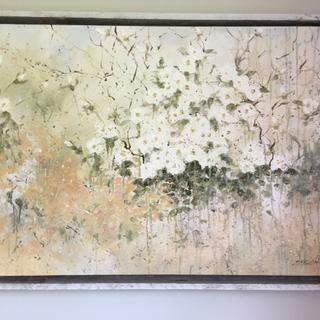 It is a floating frame...it’s white washed and the brown that you see is the space between the frame and the canvas. Just look at the photos that I submitted of my work. Your canvas is attached to the back of the floater with metal brackets. The bracket is screwed into your canvas then screwed to the frame, thus floater. I only use these floaters for my paintings. The picture looks a little innacurate. There’s a second “step” inside of the dark area that the canvas rests on and that centers the canvas in the floating area. We’ve been happy with the frame. BEST ANSWER: Hello! Thank you for your inquiry. The frame is not designed to support glass. 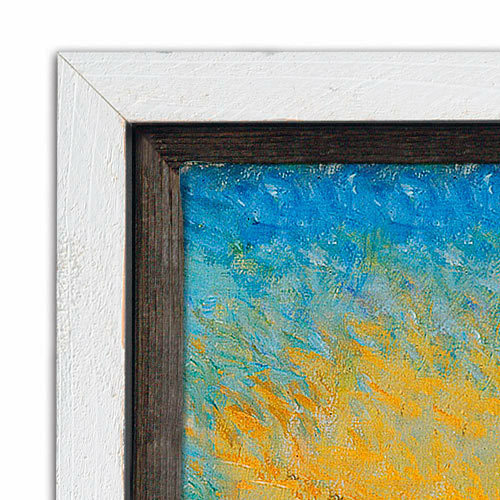 This beautiful frame is a designed to hold a canvas painting. The frame does not have a 'lip' to hold the glass in with. 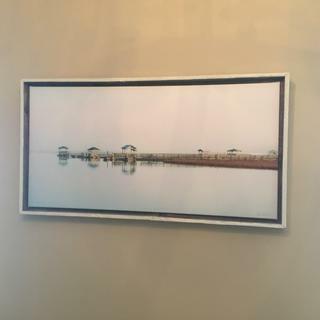 If you are not framing a canvas please consider using a different frame choice. Please consider our suggestion below which is another white wash frame. If you have any questions, please let us know. Have a wonderful day!